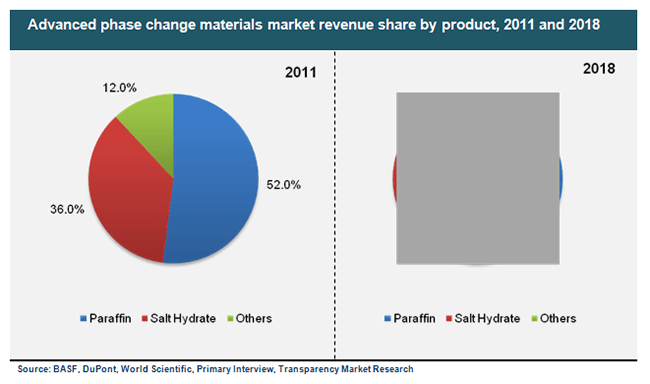 Transparency Market Research (TMR) has published a report, titled “Advanced Phase Change Materials Market - Global Industry Analysis, Size, Share, Growth, Trends and Forecast, 2012 - 2018”, which presents insights into the factors driving and restraining the global advanced phase change materials market. The 98-page report presents a comprehensive overview of the market, aimed at updating the industry stakeholders about the prevailing market dynamics. Based on an in-depth survey, the report presents refined forecasts pertaining to the market’s future prospects. Advanced phase change materials or APCMs can store and release a large amount of thermal energy upon changing from one state to another. Based on the type of product available in the market, the global advanced phase change materials market is segmented into biobased, organic, and nonorganic materials. Globally, the total energy supply has significantly increased. Furthermore, the construction industry is exhibiting a robust expansion in developed as well and developing economies, thereby fuelling demand from the global APCMs market. According to the findings of the report, the global market for advanced phase change materials is likely to exhibit an impressive CAGR of 19.50% between 2012 and 2018. The latest technological advancements in APCMs aimed at providing a potential alternative to reduce the average energy consumption will also give impetus to the global market for APCMs. The market, according to the report, gains much traction from the increasing population, particularly in large economies such as China, the U.S., and India. Such rising population bolsters construction activities across these economies, subsequently fuelling demand from the global APCMs market. Europe, as per the report, dominated the global APCMs market in 2011, accounting for 34% of the overall market. Increasing demand from economies such as Germany, France, and the U.K. has given a significant boost to the market for APCMs in Europe. The primary focus of this region on energy conservation by effectively reducing unnecessary energy consumption is anticipated to drive the market for APCMs in Europe. Asia Pacific, according to the report, has emerged as the second largest market for APCMs, accounting for over 25% of the global APCMs market. Rapid industrialization in the region has spurred the demand from APCMs from Asia Pacific. Among the segments based on product type, paraffin-based APCMs exhibited the highest demand in 2011, accounting for about 50% of the overall market. In 2011, the paraffin-based APCMs segment was valued at US$95 mn in 2011. Other segments such as bio-APCM and salt hydrates are also likely to exhibit a steady CAGR through the report’s forecast period. Based on application, the report segments the global APCMs market into HVAC, building and construction, shipping and transportation, commercial refrigeration, energy storage, and others.